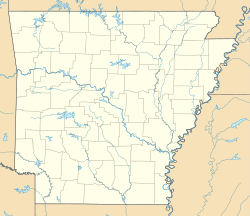 Etymology: Greek for "Brother of Arkansas"
Location of Arkadelphia in Clark County, Arkansas. Arkadelphia is located in northeastern Clark County at 34°7′19″N 93°3′58″W﻿ / ﻿34.12194°N 93.06611°W﻿ / 34.12194; -93.06611 (34.121920, -93.066178), on the west bank of the Ouachita River. 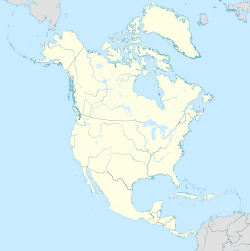 According to the United States Census Bureau, the city has a total area of 7.3 square miles (18.9 km2), of which 7.3 square miles (18.8 km2) is land and 0.04 square miles (0.1 km2), or 0.49%, is water. The climate is characterized by hot, humid summers and generally mild to cool winters. According to the Köppen climate classification system, Arkadelphia has a humid subtropical climate, abbreviated "Cfa" on climate maps. As of the 2010 United States Census, there were 10,714 people residing in the city. The racial makeup of the city was 64.0% White, 30.0% Black, 0.4% Native American, 0.8% Asian, <0.1% Pacific Islander, 0.1% from some other race and 1.4% from two or more races. 3.2% were Hispanic or Latino of any race. As of the census of 2000, there were 10,912 people, 3,865 households, and 2,187 families residing in the city. The population density was 1,486.2 people per square mile (574.0/km²). There were 4,216 housing units at an average density of 574.2 per square mile (221.8/km²). The racial makeup of the city was 68.98% White, 26.51% Black or African American, 0.53% Native American, 1.29% Asian, 0.05% Pacific Islander, 1.35% from other races, and 1.28% from two or more races. Hispanic or Latino of any race were 2.59% of the population. There were 3,865 households out of which 27.0% had children under the age of 18 living with them, 38.6% were married couples living together, 15.3% had a female householder with no husband present, and 43.4% were non-families. 31.7% of all households were made up of individuals and 13.7% had someone living alone who is 65 years of age or older. The average household size was 2.26 and the average family size was 2.87. In the city, the age distribution of the population shows 18.1% under the age of 18, 32.9% from 18 to 24, 20.4% from 25 to 44, 14.5% from 45 to 64, and 14.1% who are 65 years of age or older. The median age was 24 years. For every 100 females, there were 85.6 males. For every 100 females age 18 and over, there were 82.4 males. The median income for a household in the city was $26,651, and the median income for a family was $42,479. Males had a median income of $30,152 versus $19,459 for females. The per capita income for the city was $13,268. About 19.8% of families and 23.2% of the population were below the poverty line, including 25.8% of those under the age of 18 and 15.9% of those 65 and older. Major factors in Arkadelphia's economy are education and manufacturing. Ouachita Baptist University, Henderson State University, and Arkadelphia School District employ many people in the education sector. The manufacturing sector consists of Alumacraft Boat Co., Danfoss Scroll Technologies LLC, Georgia Pacific, and Siplast. The economy includes small-scale businesses, including fast-food restaurants. The city is served by a now bi-weekly, The Siftings Herald. Opened in 2011, the Arkadelphia Arts Center hosts exhibits, productions and educational workshops for many organizations in town, including the Caddo River Art Guild, the Poet and Writer's Guild, the Little Theatre, the two universities, and Arkadelphia School District. Henderson State University holds plays and musical performances in Arkansas Hall located on campus. Ouachita Baptist University displays student art and sculpture in the Hammons Gallery. OBU performing arts take place in the OBU Jones Performing Arts Center on Ouachita Street. The Clark County Historical Museum contains artifacts from prehistoric times through today in an attempt to document the history of the county. Based in the former Amtrak station, a historic tour through Arkadelphia, including the historic James E. M. Barkman House. The Captain Henderson House is a historic bed and breakfast owned and operated by Henderson State University and originally inhabited by the university's namesake. Downtown Arkadelphia includes the Arkadelphia Commercial Historic District, the Arkadelphia Confederate Monument, Clark County Courthouse, and the Clark County Library, all listed on the National Register of Historic Places. Other family attractions include the Diamond Lakes Regional Visitors Center on Highway 7 near I-30, and the Reynolds Science Center Planetarium, open to the public during the academic year, is located on the Henderson State University campus. Arkadelphia Parks and Recreation Department operates facilities and manages activities for the community. Within Feaster Park, the department operates Arkadelphia Aquatic Park, which features water slides, swimming, and diving areas. The park includes a recreation center that has an indoor basketball/volleyball court, a weight lifting area and an elevated walking track. In 2013, the department completed construction of DeSoto Bluff Trail, which overlooks the Ouachita River. DeGray Lake Resort State Park surrounds 13,800-acre (5,600 ha) DeGray Lake, which is located 8 miles northwest of Arkadelphia, on Arkansas Scenic Byway 7. The state park has facilities for camping, fishing, water sports, golf, hiking, and biking. The Iron Mountain Bike Trail is a winding path inside the park that runs for approximately 26 miles (42 km). The Caddo and Ouachita rivers merge just outside the northern city limits. Canoe and tube rentals are available in nearby Caddo Valley, Arkansas. The Ouachita National Forest and Hot Springs National Park are located on the scenic byway, approximately 30 miles (48 km) north of Arkadelphia. To the west of Hot Springs is Lake Ouachita, which has more than 690 miles (1,110 km) of shoreline and more than 40,000 acres (16,000 ha) of water. The lake is surrounded by Ouachita National Forest. The tourist destination of Hot Springs is located adjacent to the national park. Bathhouse Row, Oaklawn Park Race Track and Casino and Magic Springs are some attractions located there. Arkadelphia operates under the city manager form of government. There is a seven-member city council known as the board of directors that appoint the city manager. Five members of the board are elected via ward. Two members are elected at large, one of which is the mayor position. Henderson State University is a public liberal arts, undergraduate institution that is a member of the Council of Public Liberal Arts Colleges. The university was founded as Arkadelphia Methodist College in 1890, and was renamed Henderson-Brown College before it became a public institution in 1929. Its current name was adopted in 1975. Ouachita Baptist University is a private, liberal arts, undergraduate institution that is affiliated with the Arkansas Baptist State Convention. The university was founded as Ouachita Baptist College in 1886, and its current designation was established in 1965. For the 2011–2012 school year, there were approximately 2,125 students enrolled. In September 2015, voters in the Arkadelphia School District passed a millage increase earmarked for new elementary and middle schools. Dr. Donnie Whitten is District Superintendent. Clark County Christian Academy. K4 through 12th grade. Arkansas Institute for the Blind was located in Arkadelphia from 1859–1868. Baptist Health Medical Center-Arkadelphia – a Hospital which provides a wide variety of services, including the 'Arkadelphia Medical Clinic', and a Women's Health Clinic. CHI St. Vincent Heart Clinic Arkansas – provider of specialized Cardiology services. The Surgical Clinic of Central Arkansas – a comprehensive General Surgery provider. Baptist Health Orthopaedic Clinic – General, sports, and joint replacement. Arkadelphia is intersected by Interstate 30, a primary east-west Interstate highway running northeast 68 miles (109 km) to Little Rock, 77 miles (124 km) southwest to Texarkana, and 254 miles (409 km) southwest to Dallas. US Route 67 runs parallel to I-30 and connects Arkadelphia to Malvern 25 miles (40 km) to the northeast and Gurdon 15 miles (24 km) to the southwest. Highway 8 and Arkansas Highway 51 serve as primary east-west arterials for Arkadelphia. Arkansas Highway 7 provides a primary north-south route and has been designated as an Arkansas Scenic Byway. Arkansas Highway 874 is a system of state highways that serve Henderson State University. Passenger rail service is provided by Amtrak's Texas Eagle, which stops at Arkadelphia station. Trains run daily between Chicago and San Antonio. Connecting service between San Antonio and Los Angeles is available three times a week via the Sunset Limited. Freight service in Arkadelphia is provided by Arkansas Midland Railroad and the Union Pacific Railroad. Dexter B. Florence Memorial Field (KADF) in southeastern Arkadelphia can serve small business jets as well as single and double-engine aircraft. Henderson State University offers a four-year bachelor of science degree in aviation and is responsible for the airport's fixed-base operation. Water and sewer utilities are provided by Arkadelphia's municipal water & wastewater system. The city's electric system is maintained by South Central Arkansas Electric Cooperative, Inc., and natural gas is provided by CenterPoint Energy. ^ a b "Geographic Identifiers: 2010 Demographic Profile Data (G001): Arkadelphia city, Arkansas". U.S. Census Bureau, American Factfinder. Retrieved June 16, 2014. ^ "Arkadelphia (Arkansas, United States) – Encyclopædia Britannica". Britannica.com. Retrieved 2013-07-10. ^ "American FactFinder". United States Census Bureau. Archived from the original on 2013-09-11. Retrieved 2014-09-25. ^ "Grand Opening, Arkadelphia Arts Center". InArkansas.com. October 11, 2011. Retrieved April 21, 2013. ^ "Diamond Lakes Regional Visitors Center". Arkadelphia Regional Economic Development Alliance – ArkadelphiaAlliance.com. ^ "Reynolds Science Center Planetarium". Henderson State University – HSU.edu. ^ "Parks And Recreation". Municipal Government of Arkadelphia, Arkansas. ^ Bryan, Wayne (June 20, 2013). "Arkadelphia's DeSoto Bluff now more accessible". Arkansas Democrat-Gazette (Three Rivers Edition). ^ "Iron Mountain Mountain Bike Trail". Arkansas Cycling & Fitness – ArkansasCycling.com. Archived from the original on 2016-02-03. ^ Wright, Drew (June 17, 2015). "Arkadelphia Board of Education discusses millage increase". The Daily Siftings Herald. ^ Leigh, James (September 15, 2015). "Public approves millage increase for Arkadelphia Public Schools". The Daily Siftings Herald. ^ "Staff Directory". Arkadelphia School District – ArkadelphiaSchools.org. Retrieved 2016-02-17. ^ "Clark County Christian Academy". Clark County Christian Academy – Pages.SuddenLink.net. ^ "Catalogue of the Library of the Surgeon General's Office, United States Army, Volume 3". U.S. Government Printing Office, 1874 (p.147). ^ "Arkansas School for the Blind (ASB)". Amy Craig, Brent McGehee, Joshua Nichols, Jessica Wilson, Leon Tidwell, Ann Moore, and Sharon Berry, Arkansas School for the Blind, The Encyclopedia of Arkansas History & Culture – EncyclopediaOfArkansas.net. ^ "Baptist Health Medical Center-Arkadelphia". Baptist Health – Baptist-Health.com. ^ "Baptist Health". Staff of Baptist Health, The Encyclopedia of Arkansas History & Culture – EncyclopediaOfArkansas.net. ^ "Heart Clinic Arkansas". Heart Clinic Arkansas – HeartClenicArkansas.com. Archived from the original on 2016-03-01. ^ "Satellite Surgical Clinics". The Surgical Clinic of Central Arkansas – SurgicalClinicArkansas.com. ^ General Highway Map, Arkadelphia, Clark County, Arkansas (PDF) (Map). Cartography by Planning and Research Division. Arkansas State Highway and Transportation Department. April 2006. Retrieved February 17, 2016. ^ "Arkansas Scenic 7 Byway". Arkansas Department of Parks & Tourism. Retrieved February 17, 2016. ^ "Texas Eagle". Amtrak. Retrieved 2016-02-17. ^ "Municipal Airport Advisory Committee". Municipal Government of Arkadelphia, Arkansas. City of Arkadelphia. ^ "Aviation". Henderson State University. Henderson State University. Archived from the original on 2016-01-30. ^ "Arkansas Public Transportation: Rural Public Transportation Systems". Arkansas Transit Association – ArkansasTransit.com. ^ "Arkadelphia Water & Sewer". City of Arkadelphia – CityOfArkadelphia.com. ^ "South Central Arkansas Electric". South Central Arkansas Electric Cooperative – SCAEC.com. ^ "Communities We Serve-Arkansas". CenterPoint Energy – CenterPointEnergy.com. ^ "Biography of the Honorable Johnny Key, Arkansas State Senator" (PDF). arkleg.state.ar.us. Retrieved December 5, 2013. ^ "Dr. Rod Martin to Speak at 2015 Commencement". Hannibal LaGrange University. Archived from the original on 17 January 2016. Retrieved 13 January 2016. Wikimedia Commons has media related to Arkadelphia, Arkansas. Wikisource has the text of the 1905 New International Encyclopedia article Arkadelphia.